There are a few things in life that can take precedence over gaming. Eating. Sleeping. Breathing. Yeah, that's about it. So if you missed out on a few of last year's biggest games while you were tending to those responsibilities, don't worry. The PlayStation Store's 14 for '14 sale will help you redeem your status as a gaming superfan. From January 14–21, PlayStation is offering up to 50 percent off 2013's fourteen most celebrated titles. Oh, and they're also including fourteen of this year's must-have PS Vita games in the savings mix. Not a bad way to start the new year. While your friends are busy already breaking their New Year's resolutions, you'll be catching up on last year's gaming heavyweights. 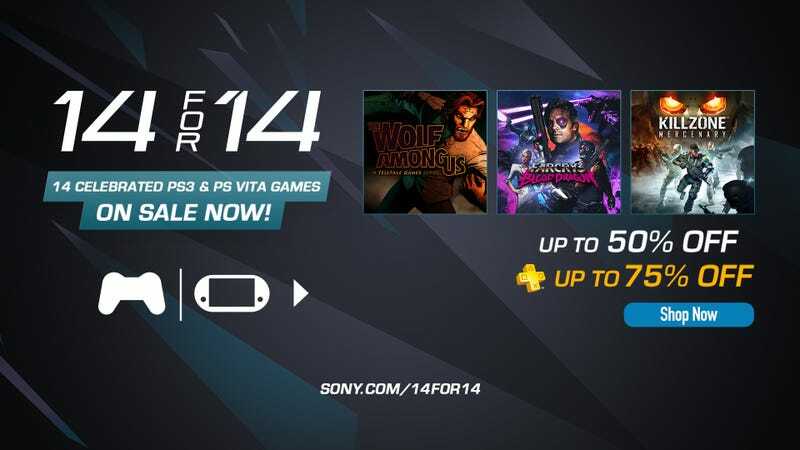 Head here to shop the PlayStation Store's 14 for '14 sale today! Just don't forget to breathe every now and then, okay? Andrew Kardon is a freelancer writer and daddy blogger who lives for video games, comic books, sushi and everything '80s. He still holds on to the belief that the Atari 2600 was the greatest gaming system ever made.